Hepatocellular carcinoma (HCC) is relatively uncommon in the United States, although its incidence is rising, principally in relation to the spread of hepatitis C virus (HCV) infection. Worldwide, HCC is the sixth most prevalent cancer and the third leading cause of cancer-related deaths. Anatomy of the liver. 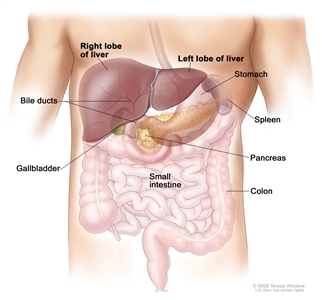 The liver is in the upper abdomen near the stomach, intestines, gallbladder, and pancreas. The liver has four lobes. Two lobes are on the front and two small lobes (not shown) are on the back of the liver. Check the list of NCI-supported cancer clinical trials that are now accepting patients with stage 0 adult primary liver cancer (BCLC), stage A adult primary liver cancer (BCLC) and stage B adult primary liver cancer (BCLC). The list of clinical trials can be further narrowed by location, drug, intervention, and other criteria. After 321 deaths, the median survival was significantly longer in the sorafenib group (10.7 months vs. 7.9 months on placebo; hazard ratio [HR] favoring sorafenib, 0.69; 95% confidence interval [CI], 0.55-0.87; P < .001). The median OS rate was 6.5 months for the sorafenib group versus 4.2 months for the placebo group (HR, 0.68; 95% CI, 0.50-0.93; P = .014). Check the list of NCI-supported cancer clinical trials that are now accepting patients with stage C adult primary liver cancer (BCLC) and stage D adult primary liver cancer (BCLC). The list of clinical trials can be further narrowed by location, drug, intervention, and other criteria. Check the list of NCI-supported cancer clinical trials that are now accepting patients with recurrent adult primary liver cancer. The list of clinical trials can be further narrowed by location, drug, intervention, and other criteria.